The largest city on the Eastside and the fifth largest in the state, Bellevue offers a high quality of life, strong sense of community, robust neighborhoods, and a commitment to building a healthy, vibrant future economy. Bellevue incorporates 31 square miles between the pristine waters of Lake Sammamish and Lake Washington. The city has acres of trails, open spaces and wetlands, and nearly 100 parks that offer activities ranging from a working farm and play areas, to waterfalls and wildlife habitat. Quiet wooded neighborhoods and parks flourish along with a bustling downtown that is truly the urban heart of the Eastside. Downtown is a vibrant collage of high-rises, parks, museums and excellent shopping, including the Pacific Northwest’s first Neiman Marcus store. Nearby, The Bellevue Collection is arguably the destination shopping capital of the Northwest. The city’s strong public art program has helped to shape a distinctive, people friendly downtown that is the focal point of a thriving arts community. The Theatre at Meydenbauer Center features performances by Ballet Bellevue, the Bellevue Philharmonic, Bellevue Chamber Chorus and Bellevue Civic Theatre. The Bellevue Arts Museum offers enriching exhibits, lectures, and workshops. Within walking distance is the Rosalie Whyel Museum of Doll Art. The Bellevue Jazz Festival each spring is among the region’s premier celebrations of national and regional musical talent. Each July, the arts and crafts fair weekend in downtown is one of the nation’s largest and most prestigious art festivals. Another summer attraction, the Bellevue Farmers Market, is open Thursdays and Saturdays just north of the city center. Nearly 6,000 people call Downtown Bellevue home. Over the next 20 years, most of the city’s job and residential growth will occur downtown and in the city’s Bel-Red Corridor. As its population increases and becomes more diverse, it reflects Bellevue’s status as a growing metropolis and international economic center. Income levels are well above both King County and Puget Sound regional averages. With an estimated 140,000 jobs within the city, Bellevue has more jobs than residents. Its diverse economy includes a strong employment base in growing industries such as information technology. 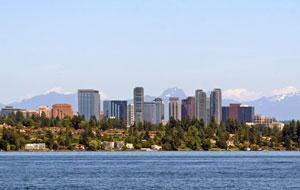 Bellevue also benefits from a highly skilled and educated workforce. Education is a priority here and it shows. In 2010, Newsweek ranked five Bellevue schools in the top 100 high schools in America. Bellevue offers diverse housing choices to suit any lifestyle-from stunning waterfront estates to suburban ramblers to downtown condominiums. New construction leans toward larger, more expensive homes. On the hills southeast of downtown, Newport Hills (one of the County’s first planned residential areas) has a thriving commercial center that includes Factoria Square Mall, as well as a multitude of single and multi-family housing options. Apartment complexes and smaller homes dominate the Crossroads and Lake Hills neighborhoods where some of Bellevue’s most reasonably priced homes are located. Crossroads Shopping Center is the people-packed heart of this area featuring a seasonal farmers market, ethnic and folk music, cultural events and the smells of global cuisine.